Saturday, November 3, 2007 10:00 a.m.
Due to the death of Robert Faith, the below listed tractors and equipment will be sold at Public Auction on the Faith farmstead, located 5 miles south of Lincoln, IL, just off State Route 121. MISCELLANEOUS: bolt bins; propane weed burner; hydraulic gages & fittings; ratchet binder; log chains; Maruyama string trimmer; iron pile; 40" pull type lawn sweeper; 3.5 hp garden tiller. 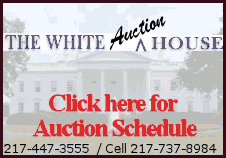 TERMS: Cash or good negotiable check payable on the day of the Auction. Registration videotaped and a valid photo ID is required to obtain a buyers number. Buyers must show provided number for each and every purchase. Announcements sale day take precedence over printed material. Not responsible for accidents or property after sold. All items must be removed on the day of the Auction. Sunday, November 11, 2007 2:00 p.m.
Legal Description: Lots Lots 10, 11, and 12, Block 4 in Village of Broadwell, Logan County, Ill. If you are looking for a clean, affordable home in a small community, this could be the place for you. This roomy, fully carpeted, double wide trailer has 2 bedrooms, 1 bath, living room, kitchen and dining area, and utility room. The refrigerator and stove, washer and dryer, water softener, and window treatments will stay with the house. It is on the new Illini natural gas line, has central air conditioning and city water. There are enclosed front and back porches. The detached 30'x 50' garage comes equipped with electricity and a furnace, half bath, is insulated and has a separate septic system. A shed measuring 8'x 14', with overhead storage, is insulated and has electricity. In addition, there is a 2 story barn measuring 24'x 24'. The roof on the house was replaced 2 years ago and the garage 3 years ago. The established landscaping and functional garden complete the attractive package. Open house will be on November 4th from 2:00-4:00 p.m.
or by appointment with auctioneer. TERMS: Purchaser will enter into a written agreement to pay 10% down at time of sale, with balance due within 30 days or delivery of clear title. The house sells as is with no warranties or guarantees. The seller reserves the right to reject all bids. AUCTIONEERS NOTE: "Loved and well cared for" are the appropriate words to describe this home and property. Call us or come and see for yourself.